Southern Audio Services, Inc (SAS), maker of the Yak Power brand of quality 12v electronics control systems and accessories for fishing kayaks, is now available at all Bass Pro Shops stores nationwide. This past October they began shipping their new patent pending Power Panel switching systems (YP-RP5R) and Power Port 12v outlets (YP-PMC48S/96S/144S) to Tracker Plastics for OEM installation in Bass Pro Shops new 2017 Ascend 128T Yak Power edition kayak. The 128T Yak Power started showing up in stores as early as January 2017 and will now be joined by the Yak Power aftermarket products for consumers to purchase and easily install on any kayak. Originally developed for Ascend kayaks, the Yak Power switching system is an electronics control system designed to make it quick and easy to add and control 12v electronics to a kayak. Having developed OEM products before for Toyota, SCION, and other OEM manufactures under our Bazooka brand, we understood the assembly line challenges associated with adding electronic switching in a production environment and developed the Yak Power system to address those challenges – Jon Jordan, President of SAS. The Power Panel requires only one 2 1/8” hole for mounting the main control panel into an easily accessible wall of the kayak. From there a single control cable is run to a switcher box that can be stowed away in the hull or other easy to reach hatch compartment. The Power Panel switching system then uses all Yak-Power plug-and-play connectors making it easy to configure and add accessories. Powering the system is also simple. It plugs directly into the Yak Power custom Power Pack battery box (YP-BBK) or into the Yak Power Battery Terminal Pig Tails (YP-BTP12 or YP-BTP96). No cutting or splicing is required. With 5 switched outlets, you can connect your fish finder, bait well pump, LED lighting, phone charger, and any other 12v accessory you need out on the water. All accessories are connected and controlled independently using individual buttons on the control panel. Each button turns RED when it is activated making it easy to see which buttons are in use. And, the Master Power switch allows you to completely power up-down the entire system with the press of a button to minimize your power consumption while out on the water. 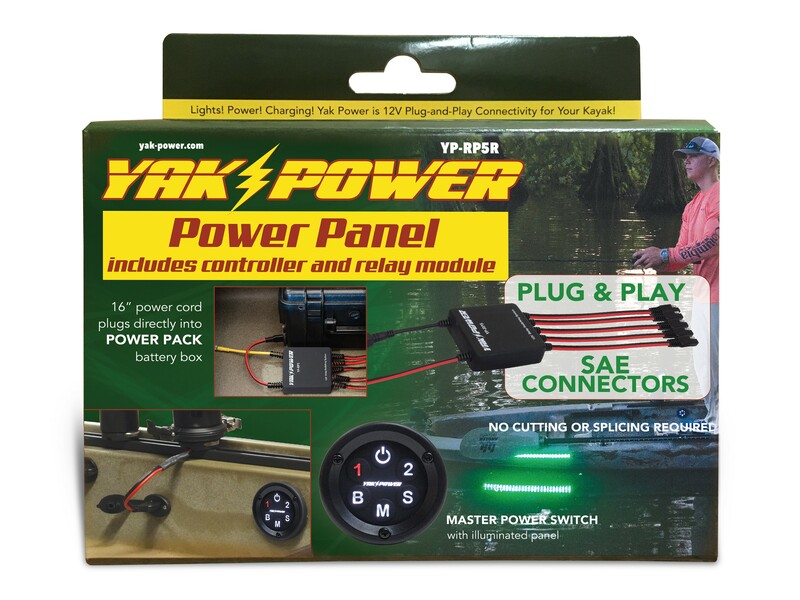 The entire line of Yak Power products will be carried by Bass Pro Shops nationwide with the Power Panel, Power Ports, Battery Terminal Pig Tails, and Power Plug accessory connectors on the way to stores now. The Power Pack battery box, LED Light Kits, and even a wireless remote control module are expected to arrive late this month. Yak-Power lets you spend less time rigging and more time fishing. Control the Current!